Institutional Review Board System - CIS 4372 HCI and Data Viz. the protection of human subjects used in research at the University by complying with regulations specified by the Department of Health and Human Services, as well as with other ethical and professional standards. 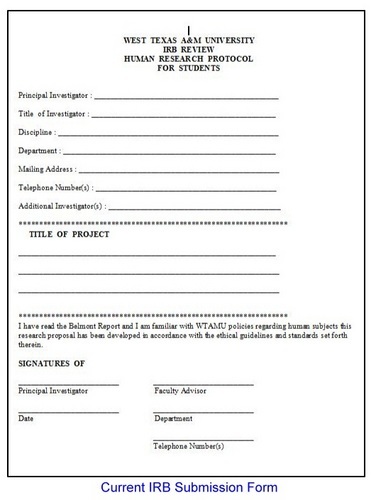 Anyone conducting a project that includes human subjects at WTAMU must first contact the university's Institutional Review Board to verify compliance with the IRB's Policies and Procedures before beginning research. After a formal proposal has been submitted, it may take anywhere from 2 weeks to 6 weeks to make it through the committee review process. Research can not be started until a written IRB approval has been received by the primary investigator. 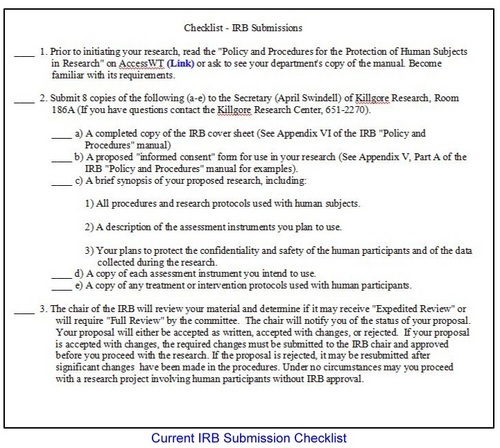 The current IRB system for reviewing proposals is paper based. 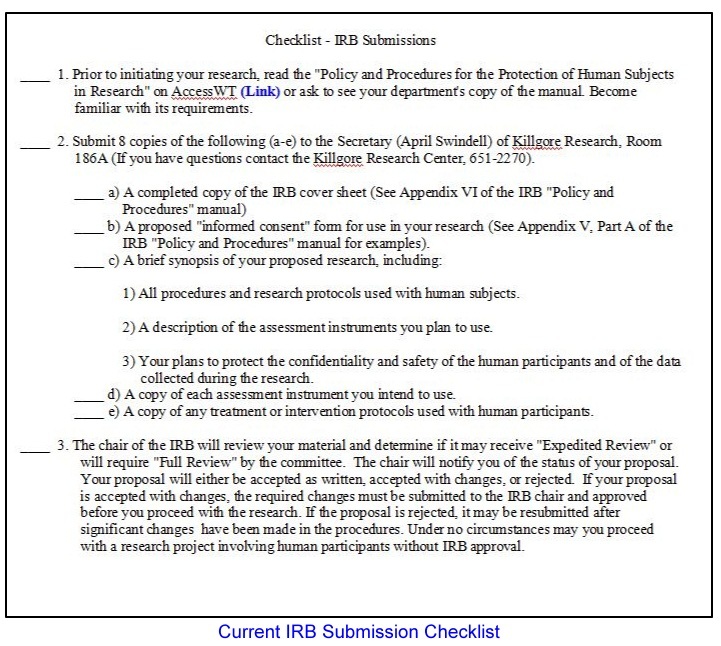 The researcher must complete all necessary paperwork, as indicated on the IRB checklist, and submit eight paper copies of the proposal to the review board. 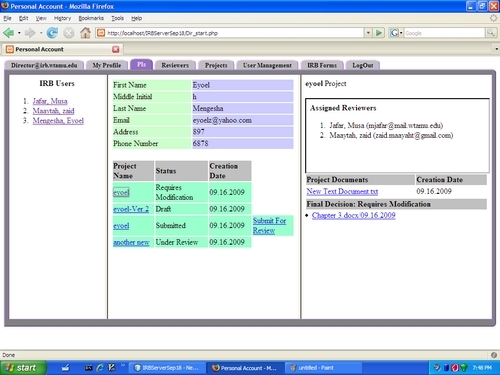 A digital system has been created to replace the current paper based system. It is in the last phases of development. Features of the digital system will allow the Review Board to be notified during the various phases of the review process by logging into the system. Reviewers will also be able to modify and track modifications of documents and the status of documents. 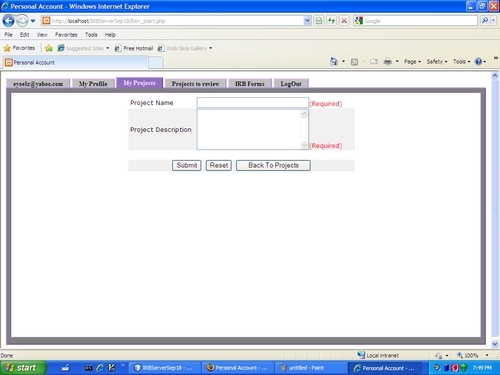 Integration of the system with an e-mail server has been proposed and would allow notifications to be sent by e-mail. Table Charlie will examine how expert reviews may have been used during the development process. Table Charlie will develop prototypes of the IRB System and discuss implications with various interface design methodologies.